Here’s another gourmet kitchen offering in my quest to make every gift for Christmas this year. About a week ago a local grocery had raspberries at ridiculously low prices. ($1.77 per half pint). That’s unheard of this time of year so I had to buy some. When raspberries go on deep discount it means one of two things. 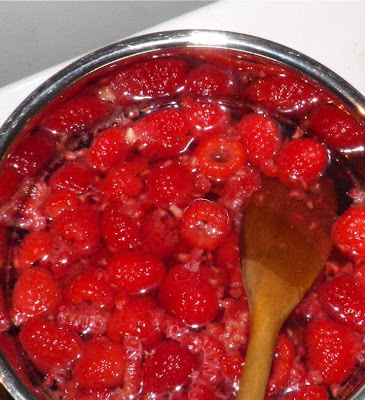 Either the raspberries are tasteless, or they’re about to go moldy. In my experience it’s usually the latter. That means you have to get them either into you, or into a preservative, really fast. My choice was vinegar – and then into me at a more leisurely pace. Champagne makes a wonderful addition to homemade vinegar. The only concern is the overall acidity of you finished product. It has to be acidic enough to preserve whatever natural flavourings you have introduced. I have stated the acidity of what I used in the ingredients list. You can test the acidity with a simple pH test strip. pH of 3 is normal white vinegar (5% acidity) and will preserve for a very long time. Anything less needs to be used sooner. The closer you get to 7pH the faster your vinegar needs to be used. For example, fruit may potentially lower the pH a little because juice is introduced; herb vinegars probably do not. Natural raspberry juice fortified with champagne and white wine vinegar makes this vinegar a delight both in the mouth and under the nose. 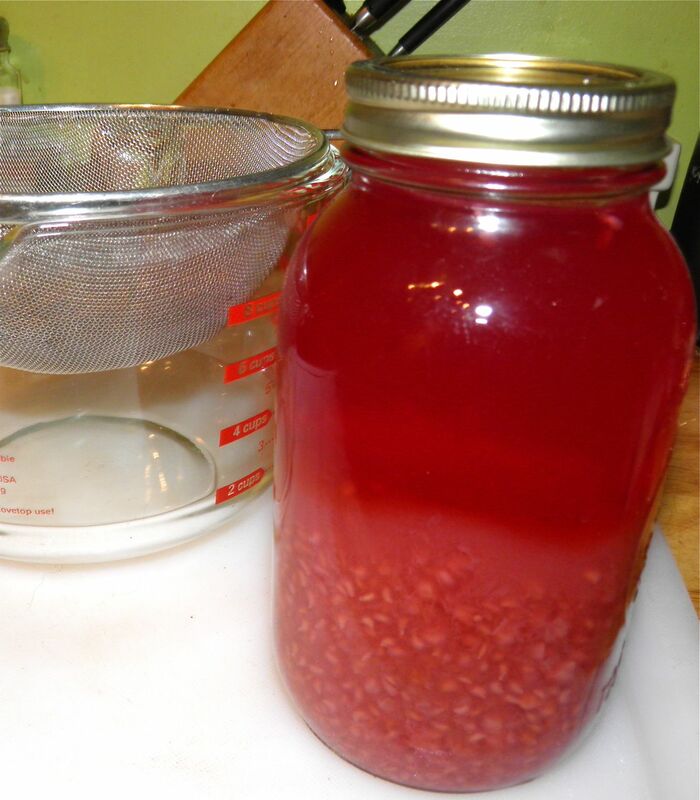 Sprinkle this vinegar over cantaloupe, berries or salad greens, or use in marinades for pork, poultry or fish. If you do gift this, pay attention to how much you decide to make. My bottles are 375 ml. 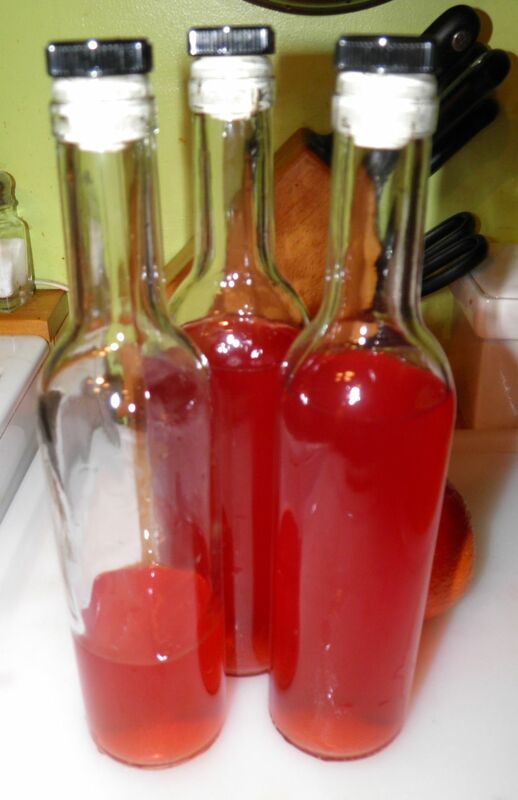 This recipe filled two bottles and left enough for the cook to try it out. If you want to enjoy this outstanding vinegar more than a couple times you may want to make a double batch. My recipe of choice with my leftover vinegar? Raspberry Marinated Duck Breast. You’ll have to come back another day to see the post! Bring all the ingredients just to a boil. The champagne will start to foam. 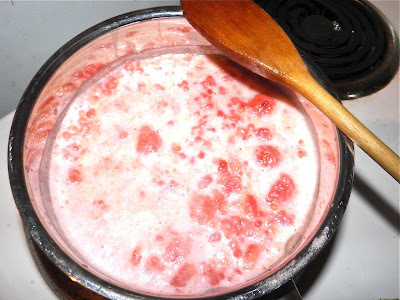 Remove from the heat as soon as it comes to a boil. Mash the berries in the pot. 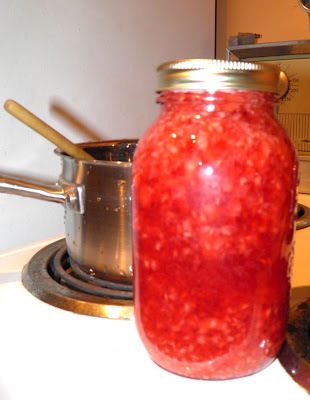 Place in a sterilized 1 L Mason jar and let sit for 6-7 days. After 6-7 days, strain out the solids through a sieve lined with cloth. will force pulp through the cloth and cloud the vinegar a little. 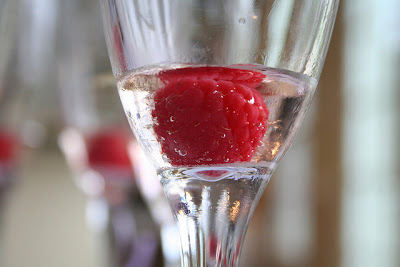 *Raspberries have a pH of over 3, so are as acidic as the vinegar, and a little more so than the champagne. I made a blueberry vinegar just by throwing the seeds and peels left after making jelly into some white vinegar and letting it sit a couple weeks before straining... I love the idea of adding champagne. Fancy!